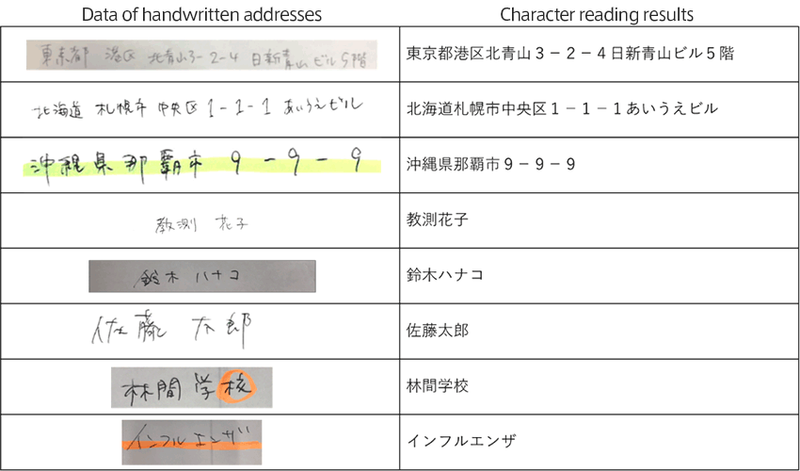 By utilizing artificial intelligence (AI) based on deep learning, EduLab, Inc has achieved 93.5% letter recognition rate of complicated handwritten characters (Japanese) including addresses and names - Press Release | EduLab, Inc. Following the trend of putting more weight on problem solving skills, the number of constructed response tests is rapidly increasing in the field of education in Japan for entrance exams, nationwide and local governments’ assessment of academic ability, and a variety of certification tests. Because constructed response tests are evaluated by humans, they take longer to mark and the increase in marking costs becomes a major issue. It is from this context that we started examining converting written letters into electronic text data in order to improve marking efficiency. To date, it has been difficult to substantialy shorten amount of time required to input content written by human hand on answer sheets and convert it into electronic text data. In addition, with conventional OCR (Optical Character Recognition) technology, which reads answer sheets using a scanner and changes them into electronic text data, it is difficult to ensure sufficient accuracy to mark due to restrictions in the writing area and cases where characters within the writing area could not be recognized. We started research and development of highly accurate letter recognition technology of handwritten characters using artificial intelligence (AI) based on deep learning and achieved a 98.66% letter recognition rate of handwritten individual characters (Japanese) in 2016.
] Single letter recognition was highly accurate, but the characteristics of Chinese characters used in Japanese, where different radicals are combined to make a single character, lowered the accuracy when recognizing multiple characters. Radicals would be recognized separately as single characters when recognizing multiple characters, which was a problem. Therefore, we started examining a method of reading multiple characters at the same time, just like how people read them, and outputing the results all together. We developed a new letter recognition technology of handwritten characters that can read (recognize) even multiple characters accurately. With this new approach, we were able to improve the process of separating multiple characters into individual characters accurately. Shown below are example data of handwritten addresses and the results of letter reading (recognizing). In the examples below, all of the address data consist of multiple characters read (recognized) without any errors (letter recognition accuracy is 100%). 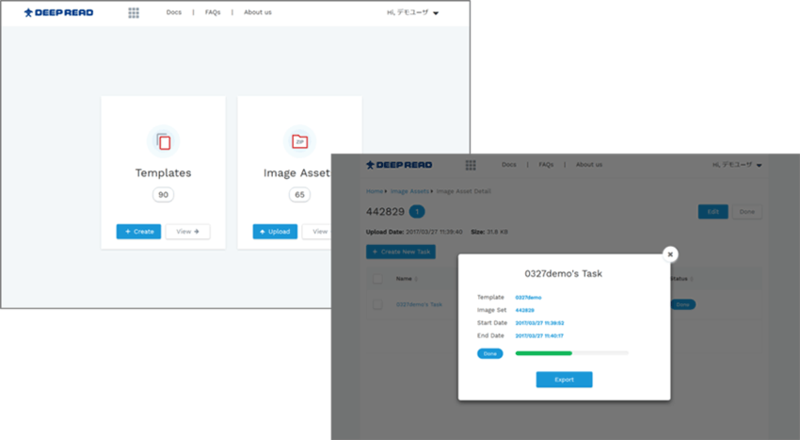 Since this technology is applicable not only for addresses but also for names, general documents, and industry-specific documents, we will repeat the process of collecting data, having artificial intelligence (AI) learn, testing, and developing the technology. We also plan to develop a cloud app so that we can provide the service to any groups or industries that have a need to use it easily. We will continue to develop this technology based on deep learning in order to improve the accuracy of letter recognition of handwritten characters. We will also strive to develop technology that automatically marks test answers converted into electronic text data from handwritten characters as well as technologies that are based on artificial intelligence (AI) in order to make marking and the marking process more efficient and automated. EduLab Group realizes educational solutions for the next generation based on the latest learning science, which includes building new businesses and investment in the field of Edtech, providing IT solutions and platforms for the education industry, and supporting next generation education and school management systems. We have offices in Tokyo, Seattle, Singapore, Hong Kong, Beijing, Shanghai, Bangalore, and Pune.